A. an Accessories Advocate, irresistibly drawn to the tools and trinkets that are used by the embroiderer? B. a Fabric Fanatic, mesmerized by any woven surfaces upon which embroidery can be performed? C. a Thread Junkie, with a Thread Fixation that keeps you addicted to needlework? If I had to choose only one of the three above, I’d have to say I’m a Thread Junkie. I just love embroidery thread! And my love of hand embroidery threads makes me Extremely Willing to try any type of embroidery thread in surface embroidery applications. But, while willing to try anything and everything, I have certain favorites that I always come back to. In the Cotton Thread Category, one of my favorite threads is coton a broder. 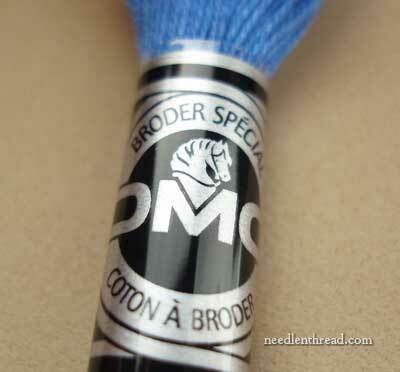 Now, there’s a problem with that name, because technically, coton a broder is simply embroidery cotton. And into the category of embroidery cotton can fit all kinds of threads: stranded cotton (the 6-stranded floss that dominates the cotton embroidery thread market), perle cotton, Danish flower thread, Mountmellick embroidery thread, and so on. And in different places, different threads are called by different names. Coton a broder is perhaps best known as a whitework or cutwork thread. It’s used, for example, in Schwalm whitework embroidery, in cutwork, in various needlelace techniques, in drawn thread embroidery, in monogramming, and in any kind of whitework surface application that you want to use it in, really! In white, coton a broder is available in a range of sizes, from size 16 (the largest) through size 30 or 35, and sometimes, if you’re lucky, size 40, although size 40 (which is quite fine) is impossible to come by in the US anymore. It used to be made in size 50! But, alas, no more, to my knowledge. 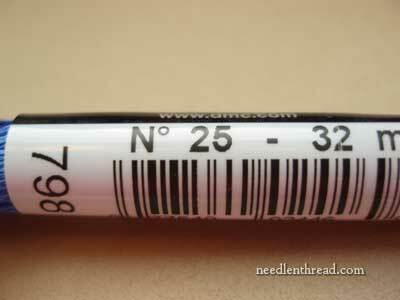 It’s a favored thread for monogramming, and the finer the thread, the finer can be the monogram. But there’s one size of coton a broder – size 25 – that comes in colors! 182 colors, to be precise. What makes coton a broder different from regular floss? First, it is a non-divisible thread, which means that you stitch with one strand as it comes off the skein – you don’t split it up. It’s a 5-ply twisted thread (each individual thread is made up of 5 plies of cotton that are twisted together to make the one thread), and this makes it a round (though fine) thread, and quite soft. What can you do with coton a broder? Well…. the possibilities are endless! Smockers love it. It can be used for cross stitch. It can be used in all kinds of cutwork and whitework techniques (in color, if you’re using size 25). It makes a wicked monogram in satin stitch! The crazy quilter incorporates it into seam treatments. And then there’s just the plain-old-every-day-run-of-the-mill surface embroidery stitching! If you like to stitch projects that incorporate color and a variety of stitch types, you’ll probably find coton a broder a good thread to add to your repertoire. If you’d like to explore coton a broder a bit more, you can read some previous articles on the subject here on Needle ‘n Thread. Especially of interest may be this comparison between coton a broder and floche. You can also search coton a broder here on Needle ‘n Thread to find other articles that mention the thread and explain something about it. You can find the whole color range of coton a broder in size 25 available at Vaune.com, which is a needlework shop primarily dedicated to smocking, but she does have quite a few other little goodies there that might be of interest to the surface embroiderer. Later on, I’ll show you a little bit of work with coton a broder – I’ve got a project up my sleeve that I’m looking forward to sharing with you! And once I get around to the photography, I’ll show you some other thread ranges that will be featured in a few upcoming projects, too. My name is Mary Corbet, and I am a Thread Junkie. Back to the first part of the article – what are you: A, B, or C? Or are you D – All of the Above? I would chose B – Fabric Fanatic. Sometimes, I love to buy new threads, but I adore to touch fabrics. I must feel linen or other material beforwe I choose it for hand embroidery. Now I’m looking for fabrics for sewing. IKEA is one of the best offline resources. 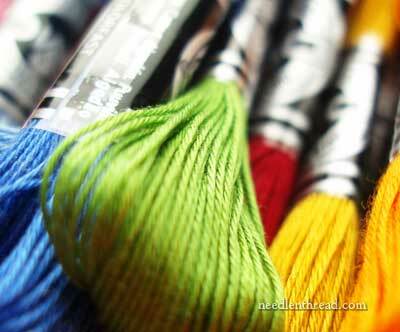 I am a C. At the moment I am firmly hooked on needle painting and use mainly a single strand of stranded cotton. Sometimes I have found that even a single strand can be to thick. Well I have found the solution. I use sewing machine embroidery thread no 40. For me it works quite well. The only difference it is not in cotton though. I have built up a nice selection of metallic treads, polyester and rayon, mostly in Madeira. The threads have a lovely sheen and I am very satisfied with the end result so far. Tools and accessories are next, nearly on a par with threads. Regards , Elza Bester, Cape town. I’m a B, with the other 2 coming hard on it’s heels. From the quality embroidery linens to the good quilting cottons, I have my little stash, bought as bargains mostly, and love every piece. I like the quilting cottons for embellishing with surface embroidery for both practical and decorative pieces, from clothes for the Granddaughter to small pieces for greeting cards and crazy patchwork. Some op shop clothing are my greatest fabric finds and probably come into the crazy patchwork zone for embroidery I suppose. Or artist dolls. The melting pot’s the limit there, ie, isn’t any limit! Having said that, I do love my threads too, they’re the icing on the cake. I won’t start on them! LOVE! 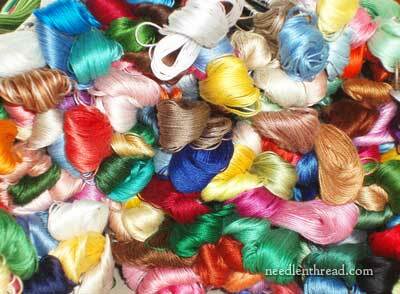 Mary, not only are you a thread junkie, you are an enabler – LOL! I have not worked with coton a broder but have a big desire to do so. As to your question about whether I am a accessories advocate, a fabric fanatic or a thread junkie or all three, I would say I aspire to all of the above and would add another category. A pattern and embroidery book collector. For that day when I will have hours and hours and devote to embroidery. Right? RIGHT!! Hours and hours and hours…! Hopefully, it’ll happen some day, Tania! How does that old song go? “They’re coming to take me away ha ha”?? I am a definite A. Then a big C and then I will realize I do not have the suitable fabric. I am looking forward for what is up your sleeve?? O, I can not wait for your blog coming up each day!! That’s a very tough question to answer but I would have to say threads are my weakness. I love to work with them (mainly in crazy quilt applications) but I also hoard them. I have some very beautiful threads that I never use, simply because I want to keep them to look at and fondle. I really must force myself to actually stitch with them!! Coton a broder is widely used in Italy. Size 40 is no longer manufactured, so, if you find someone who still have a few skeins, it could be a good idea to buy them. I found a shop that had a few old skeins of size 40 and size 50 (!) and I bought all of them (oh, happiness!). A lady gave me two skeins of size 60 (so thin and smooth!) and I used one of them for a Hedebo embroidery on a handkerchief… I had to think a lot before cutting it, anyway! Speaking of old threads, I found some old DMC cordonnet size 300, 500 and 700… yes, I’m not kidding! Really very thin! good morning Mary, my initial reaction was to say that I’m a C, I love my threads the different colours, textures and end product they can produce. Then, however, I remembered my stash of fabric. About twice a month I visit my local fabric shop and dive into the remnant bin. I have some beautiful velvets, satins, silks and cottons in a rainbow of colours, all just waiting for the current project to be finished so one of them will be selected and a new adventure commenced. So I’m proud to say I’m a fabric fanatic. I really never thought about your very interesting categories of embroiderers, Mary–because I love it all! But if I guess I would have to call myself a Fabric Fanatic. Beautiful linens and wools make me crazy happy and set my stitchlust in action. E. I love learning about the stitches! I am definitely ALL of the above! I come from a line of women “fiber artists” – quilters, weavers, embroiderers, going back 3 generations so I guess I came by it honestly. I love to stitch! Oh I’m definitely a thread junkie!!! I like the other things too, but set me loose in the thread store and I’ll be a while 🙂 I have a nice stash of white Coton a Broder, and even found a box full of white Coton a Broder (vintage) in a Trim, Lace, Ribbon ‘Lot’ I bought a few years ago. I take that box out every now and then and pet it, then I put it away. I have ventured into the colors yet, but I will! My husband tells everyone who asks about my hobby, what it is I do. Of course, he doesn’t tell them embroidery, cross stitch, etc.. No, he tell them “thread collecting”. Fabri-holic here! I cannot live too long away from a fabric store walk-thru. If I don’t then I find myself behaving badly around the bolts of cloth on display! Touching,feeling, handling, yes, even inhaling! I walk thru like it’s a field of daisies, running in slow motion with my palms out and a blissful smile on my face, which may look to others, more crazy than blissful, but whatever..! I hope you aren’t in N. California, or stores are going to have to put up ‘CAUTION: CRAZIES CROSSING’ signs…(copyright me, thank you LOL)….and be prepared for collisions! I have met a few others with this same affliction! We usually congregate around the shop cutting tables – if one of us is not “too far gone” we actually spill the beans on ourselves by random confession! Of course, that always brings hysterical laughter in that area of the store, a sure tell-tale sign that “one of us” has invaded! OH help – not only C, B, A, but D must be added – patterns and designs and books and….and…and…. I confess that after years of struggle, I’ve finally brought my fabric addiction under control, and over Christmas worked up around 25 to 30 yards of fabric to make room for needlework in my tiny sewing space (that is shared with homeschooling and a home office). I gave some odd things away to quilting groups, and threw away the scraps that were being saved for who knows what. I’ve finished most of my UFO’s, and have few more piles of fabric for those just whip it out type of projects – like pj’s, etc to clear the space for more serious work – like needlework. I only plan to buy fabric for my ecclesiastical projects going forward…. I even (sigh) throw away the Jo Ann sale flyer when it comes so there is no temptation! Can’t wait for summer vacation this year! OH – more confessions. 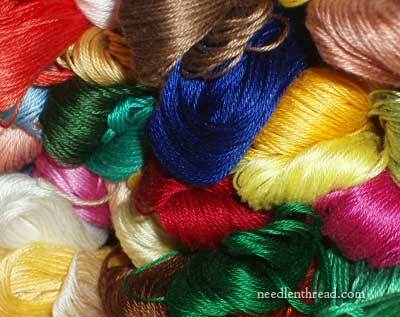 Today I just got a long awaited shipment of threads: gold, silk, floche, coton a broder – from Hedgehog Hanidworks! Oh to look at, gaze upon, and wonder how to start. What was I thinking? Full set of paraments and vestments for next Easter? Yikes – let’s add F or G to the list – lots MORE time researching archives of Needle’nThread, to learn how to do all of this! I am mostly C, then B, and then A. I, too, think Coton Boder is my favorite “whitework” thread — and monogramming. It can create that “vintage” look the best. I did find a stash of coton broder in sizes 80 and 100. They are all packed in moving boxes right now, but when I recover them, I’ll have to see just what I have got! By the way, while coton broder is not supposed to be divisible, I remember reading about a woman who was trying to recreate some of Lady Evelyn’s embroidery feats — and, since we don’t have the same variety of threads our ancestors did, to get a fine enough thread, she actually did divide the strands of coton broder. I cannot even imagine!! I’m a thoroughbred ‘C’. I too love threads and, when I’m feeling low or even relatively uninterested in embroidery, then looking through some of my collection can lift and soothe me and even give inspiration. In fact, when I was living in Taiwan, I felt lifted just by looking at an old photo on my blog of my main workbox!!! I use Anchor rather than DMC for most things and, although they do #25 in colours, I have almost the complete set of size #16 colours. Seems the range is much narrower than for DMC though, but at least they’ve just greatly improved their selection of #12 pearl cottons. Just wish my order of them would jolly well hurry up and get here! I’m a C followed closely by A! Which thread do you like bet for monograms – coton a broder or floche? Or does it depend on the type and size of the monogram? I love the sheen of satin stitches from the floche and the effect of the finer coton a broder. I believe I’m in the “D” category! All of the above!!!!! Now I just have to go and get some Cotton a Broder! It looks great! I don’t really like separating strands for embroidery, so this sounds like the kind of thread for me. I am a textile-holic. My “drug” of choice is fine 100% linen, usually from Europe. Generally I don’t spend a lot on fabrics however. I’m a remnant bin diver. Also I have been known to buy a garment at a bargain store we have here called Dirt Cheap just to cut it up for the fabric. Goodwill and Salvation Army can be sources for fabric from cut up clothing (washed first). Another source for small remnants is discontinued fabric sample books especially for fine silks and linens, often for free if you ask. Yet another source is sales priced broken sets of fine sheets and pillowcases. I’ve bought some linen napkins on sale just for the fabric, too. I must stop myself now and I apologize if I’ve led some of you fellow-holics into temptation. Definitely a “D” — books! I love seeing historical pieces, how-to’s, patterns, and collections of what others have done. It always warms my heart to see embroidery treasured and documented. sigh…i must confess to being all of the above. now that i have tried floche (at your enabling best on that one Mary…lol) i feel that i must in good conscience obtain the entire set….i’m off to a good start with 4 colors…lol…and need to buy 7 more for the crown, cross and flowers bible cover i’m making for my gdaughters confirmation….i’ve been having trouble getting my various “stashes” (fabric, flosses, 40 weight embroidery threads, beads, yarns and patterns and books for all of the aboe) organized and stored and now must find the best way to organize and store the floche. I have to say that I am B and C – there are times that I am fixated as a “B” and then time as a “C”. I am going through a “C” phase right now. 😀 Not sure if that is a good, bad, or ugly thing – as it means scrimping like crazy to get all the threads I want STAT! OR, as is usually the case after the buying – to find places to put it all! I happened to look through the replies to this post and just remembered that I know of a company called Lizbeth – they have size 10, 20, 40 and 80 Cordonnet cotton threads in solid and multicolors for tatting. I also called my LNS, and the ones that carry Lizbeth, when she orders them is Handy Hands, and they are based in Illinois. I have their phone number too if you are interested. I think I need to add an E – My name is Heather and I’m a pattern addict. I see embroidery potential in everything I see. “whatever it is I think I see, becomes a stitched design to me” or something like that! Me again! Had I waited just a little bit more, I could have given you the website of Handy Hands! I’m definitely a C followed closely by B. I have all the DMC floss and floche available, and much of the coton a broder #25. Oh, and don’t forget my growing collections of Anchor floss, Appleton wool and Au Ver a Soie, Soie d’Alger. I have enough to keep me happy and stitching for a very long time! I also have all sorts of linen, silk and cotton fabrics for stitching, although that collection is not nearly as impressive as the threads. I see one of your related articles is “the Agecroft Sweet Bag Kit”, which I just received in the mail last week. I’m a “D” much of the time, but if I was restricted to one purchase it would be threads. I love to collect them, organize them, experiment with them. Pile them up like Silas Marner and run my hands through the different colors and textures! And I must agree with the other comments about books and patterns. I canot get enough books! While I have come to love thread, especially over recent years with all the new silks and overdyes, I’ve been a pattern junkie for as long as I can remember. As ever you take my breath away with something I haven’t seen before…….believe me I shall be looking for some of this floss as I am definately a FLOSS JUNKIE ever since I was at least 6 years old and I am now 65……seriously when I was a child, my mother never worried about where I was in a dept. store or a 5 and 10…….just find the floss display and there was standing in front of it….in heaven! I am a C – Thread junkie. I have been collecting floss since I was a little girl, and my mom would let me wrap some of her floss around a little piece of cardstock. I don’t have a lot to spend, so my collection is mostly 4/$1 or 3/$1 DMC from JoAnn’s, but I have a few other kinds of threads as well – also collected on sale. For fabric, I usually use a good quality muslin, because $5.99 a yard and 40% off is much better than $79 a fat quarter!! And it was a big deal for me to get a new hoop that has an edge on it, instead of always using the 79 cent wooden kind. It was fun to read other people’s responses. Thanks for a fun post! But threads are my main love. I love them all equally, just some are more equal than others, eg, I guess rayon would have to be my least favourite although it has its uses. It is just such a difficult thread to work with. Hint Mary: a tutorial on working with rayon threads would be wonderful. I think I prefer cotton to silk even, as cotton is available in so many different forms, if it is mercerised it has a gorgeous lustre, and it is very forgiving. Can’t wait to get into the coton a broder, I have found it very difficult to find for some years, so thank you Mary for the link. Mary, the project looks beautiful. I would like to just see a close up of one or two dots. Couldn’t really get a close look at one. Getting back to my bird today…. I’m a B, C, E with E being color junkie. Not one color, but all of them and how they look together in infinite combinations. It’s really for that reason, second only to the possibility of creating something, that is making my fabric and thread stashes grow (quite) a bit faster than the creating. I just wanted to drop and say thank-you so much for sharing your knowledge, I am having so much fun learning. Threads! Definitely! I’m held back only by my budget!!! And right now, that’s tight. But, a little at a time…. The turtle wins the race! Hi, I just asked the question “what can II do with Coton A Broder” . I was surprised that you said it came in one size, 25′ I have been given a box of the above but it says No18 colour f590 a beige colour.. Do I understand that this is an old item? I was hoping that I could top stitch my quilt as I have just started quilting, machine and hand. Hi, Jan – coton a broder comes in a variety of sizes, from size 16 (heaviest) to size 30 (finest). In some countries, you can still find some of the even finer sizes, but they aren’t commonly made by DMC or Ancor anymore. However, if you’re looking for it in color, size 25 is the only size with a full range of colors. Size 18 is unusual and not produced these days by any of the larger thread manufacturers, so I’m guessing it is an older skein. My name is Melissa, and I think I am a Thread Junkie. I have referred so many people to your website, and often, they have come back to me to say how much they got out of it. My first love is cross stitch, and I am currently expanding my horizons when it comes to stitching with different threads. Last night, I tried – for the first time – to stitch with DMC coton-a-broder. However, I was utterly stumped at the first hurdle, as I couldn’t get the thread successfully from what I (perhaps wrongly) assumed was pull skein – as I have read about in the past on this site. I ended up having a complete nightmare, after untying the little knot that joined the two threads, and trying to pull one out. I ended up with a complete mess, and ended up taking my scissors – for the first time EVER – to the mess, so I could get something out of it to stitch with. Fortunately, I had got it to a point where I didn’t lose much of the thread, and found some stitchable lengths. Is there a better way I can go about this? I have read almost everything you have ever posted, so I will be happy to be referred to something you have already written. Thank you for the gold you continue to produce for us all to read and benefit from, I sincerely hope that you are doing well, and in good health. Kind regards, and happy stitching! Hi, Melissa! As a matter of fact, I have an article coming up on this! I’ve addressed it before, so I’ll be providing a selection of articles and tips. Um, unfortunately all three, to answer the question. And I have the packed-to-the-gills room to prove it! Next Next post: Goldwork Dots: Lining them Up!